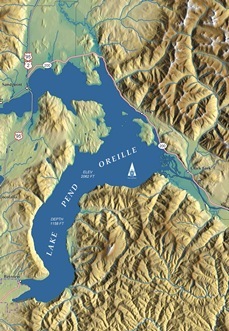 Idaho’s Lake Pend Oreille is located just 25 river miles below the mine site. During the 30-year life of the mine and beyond, metals from the mine will flow into the Clark Fork River and head downstream. Some metals will become suspended in the water column and some will be trapped in river sediments, only to be remobilized during storm and high water events. Over time, metals will accumulate in Lake Pend Oreille, degrading its water quality. The Forest Service refers to the pollution as perpetual, and the state of Idaho has raised concerns about the cumulative impacts of this long-term pollution, which could hurt the recreation economy of Sandpoint, Idaho and seriously impact the lake’s fishery. In Rock Creek, MT, Avista Utilities and the states of Montana and Idaho have spent hundreds and thousands of dollars to help recover bull trout in the lower Clark Fork-Pend Oreille Watershed. They’ve3 restored spawning tributaries impaired by sediment, purchased conservation easements and prime riparian habitat, and educated anglers to prevent unintentional bull trout harvest. If permitted, the Rock Creek mine’s construction phase alone will dump thousands of tons of silt into Rock Creek rendering it useless as a spawning tributary, killing the very species we’ve all worked so hard to protect.